You go into this book expecting something, but actually it has a lot of surprises. I mean, I was surprised and I liked what I’ve read. Quick and sweet, this is perfect of an easy and enjoyable read. The fake girlfriend becomes more involved than she ever could have imagined in her fake billionaire boyfriend’s life, passions and affairs. Gregor needs Kara in order to obtain the control of his company, together with his brothers. Kara needs Gregor’s money to fulfill her dream of having an art school. They both live on the edge – but from different perspectives. I am already used to Leslie North’s ability to add emotions to her characters. 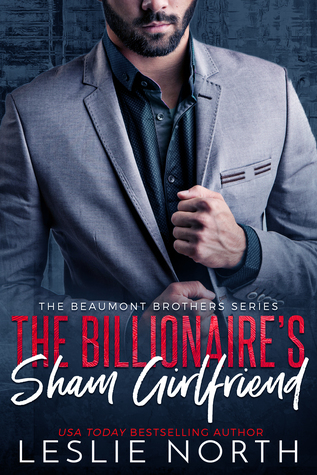 I had high expectations which have been met completely, because “The Billionaire’s Sham Girlfriend” is full of emotions and emotional conflicts. The deeper we go into the story, the deeper the feelings become. And I was missing an emotional story. I may be a sucker for this type of Romance (or Romance in general), though if you meet me on the street, I’ll never recognize it. Which is why I absolutely loved this book and I cannot get enough. I wanted so much more and I hate the ending for that. It felt rushed and abrupt. And I wanted more from the story and from the characters. Kara is amazing and Greg falls into his own plans. There is so much more to explore here. But with all my complains about the ending, I still loved it and I still want to read more. I adore Leslie North and I cannot get enough of her stories and characters. Please give this book a try, it will be worth your time. Read it and come back with your thoughts J Until next time, Happy Reading!